If you've seen our special offer of United States OSS Forgeries, then you know about the secret plans of the US Office of Strategic Services to infiltrate Nazi mails with anti-Nazi propaganda in hopes of demoralizing average German citizens. The stamps in this special offer are the other side of the story. 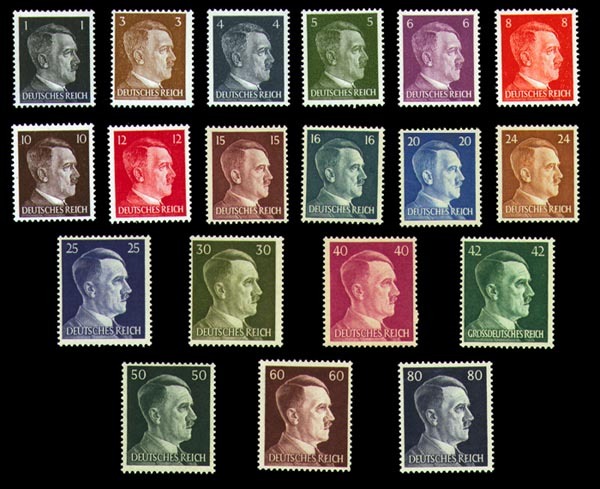 These stamps are the original Hitler Heads issued by the Germany Government during WWII. 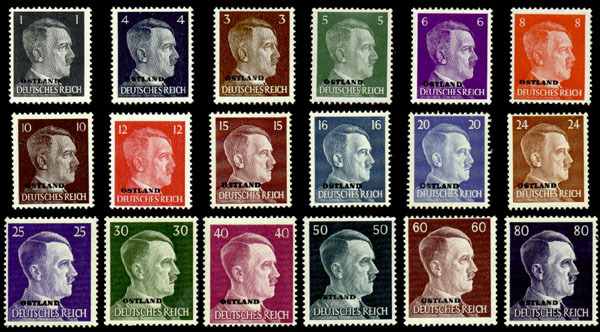 As leader of Germany and the Nazi party, Adolf Hitler demanded that his image be placed on postage stamps. 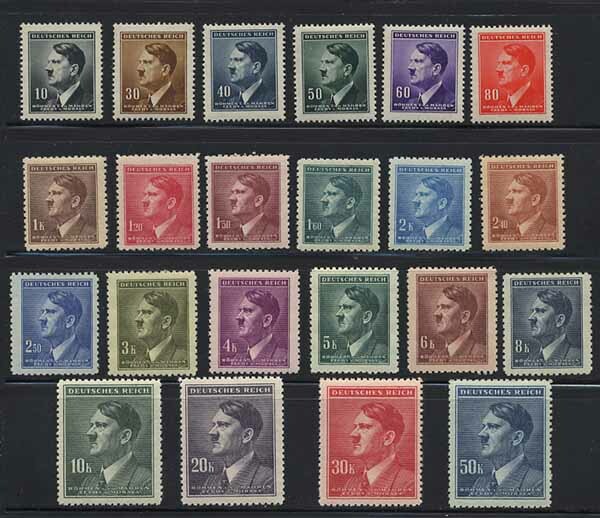 By printing these stamps and thus forcing German people to use them in their everyday lives, Hitler successfully promoted himself, the war, and the Nazi party during the hardships of WWII. But he accomplished something else too -- his image generated a commission for each stamp that was sold, not unlike today's licensing agreements of famous figures. 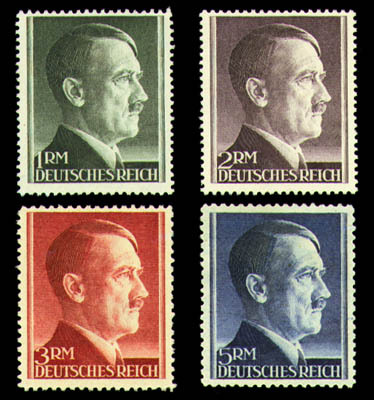 Propaganda efforts, inflation, and perhaps Hitler's pride spurred the printing of these stamps in increasing quantities as the war became more desperate for Germany. Finally, literally millions of these stamps were "liberated" from Germany by Allied soldiers as they overran towns, banks, and postoffices. Many families, even today, have some or all of these stamps tucked away in a truck and wrapped in stories of a relative who served in WWII and returned home with the stamps as souvenirs of their pains and final victory. This is your opportunity to obtain a set of these Hitler Head stamps. A favorite with collectors, these stamps serve to remind us of a time and man who at once brought a nation out of despair and depression, plunged the world into war, and attempted genocide in an effort to create a "master race". These stamps also serve as a great way to teach the young about a time and place in history that must not be forgotten. All prices are for never hinged, post-office fresh stamps. F/VF and VF/XF refer to centering. NY residents must add appropriate sales tax for county. Shipping extra. Please note: Blocks of 4 pro rata, margin or corner - add 10%. The stamp is part of a series of 22 Hitlers' facing left unlike the definitives facing right in the German Reich. Values are from 10 Heller to 50 Koruna, Michel catalogue 89/110. They are from the Third Reich occupation of Bohemia and Moravia and have minimal value.